I'm trying to create a page where I have a list of informations (each row should contain from, to, what and where). I also want to be able to add or remove rows. Therefore I made a ListView with a DataTemplate fitting to what I need. I created a DataType containing the four values I need for a row. Then I made an ObservableCollection of this DataType where I put all my rows in. I'm binding this ObservableCollection as ItemsSource for my ListView and in my DataTemplate I'm binding the values from my Datatype. When I run my application everything displays as I want it to, also adding/removing rows works. When I edit a field, e.g. 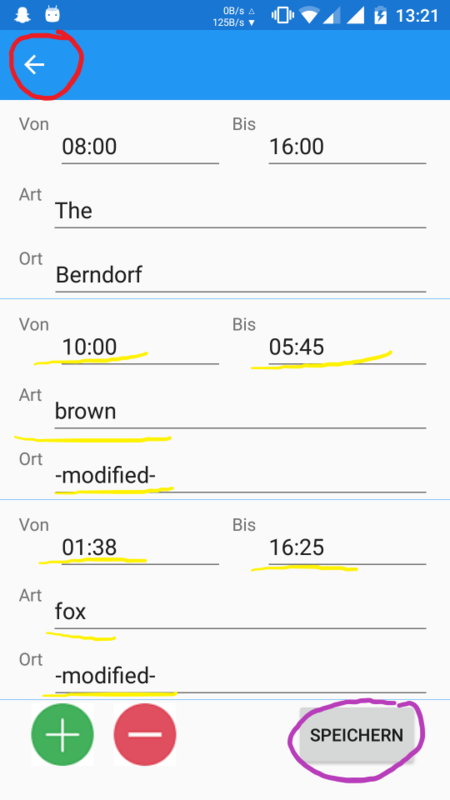 the 'fromTime' (TimePicker), the value in this field changes - fine so far. It may look nice on the UI, but when I'm looking at the data, there's something wrong.. I have a seperate class for my data containing the ObservableCollection and a standart value (for adding new rows). Seems to me like I need to bind to these values inside the observableCollection at the right index.. But I'm new to Xamarin so I don't get it. I tried to find a solution for this in forums, but couldn't find anyone facing the same problem. 2) Your list is static - so yeah, its the same list used everywhere. 2) Fixing the code would help. Wow, that was an answer! Thank's a lot. I think it's pretty obvious why, because we're binding a string to the selectedIndex property of the picker, but haven't it fixed yet. Anyway, thank you for this fast and helpful answer. I want to save my ObservableCollection in a seperate Data Class and load from there (if not null). this works only for the first time and only when I go back with the cancel button I created. But when I go back with the navigation button it is still saved (also when I open the page for the first time). When I open this page i usually want to change some values, for example the yellow underlined ones in the picture. When I'm done with that I need to save my changes by clicking on that purple marked button. But when I don't want to save my changes then I want to be able to go back without saving any changes by clicking the red marked button (or my hardware back-button). I don't know what I'm doing wrong, but it still keeps saving all changes, no matter if I ever go into that "save" case or not. In which memory(Internal or External memory) Xamarin Listview data is saved?